The honest engagement of differences in service to evangelical vigor is not advanced by the systematic misrepresentation of others’ views, by the puerile bullying of bishops, or by indulging in spasms of influence-envy. Defending the indefensible is never pretty. Or so we’re reminded by recent attempts from the portside of the Catholic commentariat to defend the madcap analysis of America’s alleged “ecumenism of hate” that appeared last month in the Italian Catholic journal, La Civiltà Cattolica (edited by the Jesuits of Rome and published after vetting by the Secretariat of State of the Holy See). The more sober-minded defenders admit that the article, jointly authored by Fr. 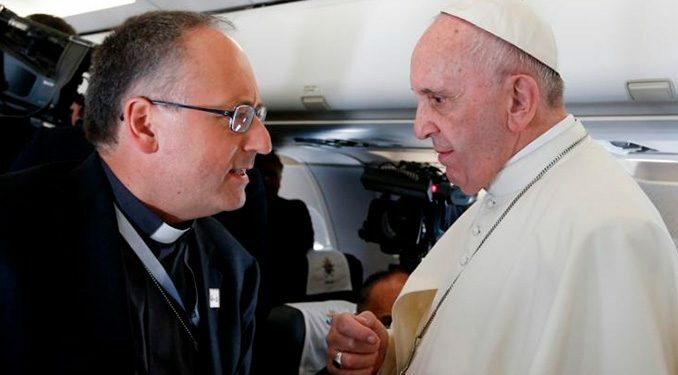 Anthony Spadaro, SJ, and Pastor Marcelo Figueroa, contains errors of fact and tendentious interpretations of recent history – but then go on to suggest that it raises important questions. How, though, are serious questions raised, much less clarified or answered, by falsifications of both history and contemporary reality? ECT is an ongoing project, which has now produced nine joint statements, with a tenth, an explanation of Christianity to its contemporary cultured despisers, coming soon. 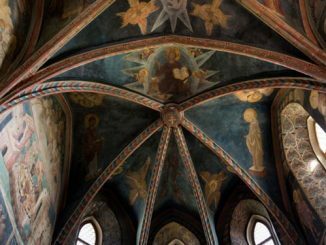 Five of the first nine—on justification, Scripture, the communion of saints, the universal call to holiness, and the Blessed Virgin Mary—were entirely theological in character and had nothing to do with political controversies. 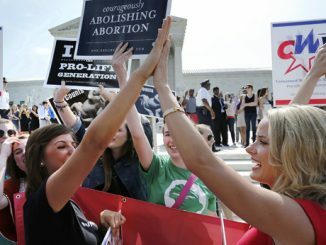 Those that touched on contested issues – the statements on the sanctity of life, on religious freedom, and on marriage—set the discussion of public policy in an explicitly biblical and theological context (as, indeed, did the initial ECT statement the Reporter editorial deplores). But don’t just take my word for it. Get the book that collects the first nine ECT documents and explains both the genesis of the project and of each statement: Evangelicals and Catholics Together at Twenty: Vital Statements on Contested Issues, edited by Timothy George and Thomas G. Guarino (Brazos Press). Read it. Then compare what you read with the NCR editorial. In his June address to the U.S. bishops, Archbishop Christoph Pierre, the apostolic nuncio to the United States, appealed for a Church that listens more, “even to those with whom we disagree,” because the honest engagement of differences helps us all “propose the…Gospel in a more persuasive, life-changing way.” True enough. The honest engagement of differences in service to evangelical vigor is not advanced, however, by the systematic misrepresentation of others’ views, by the puerile bullying of bishops, or by indulging in spasms of influence-envy. 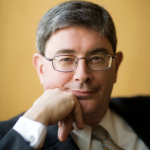 Moreover, the Nuncio’s welcome appeal to become a Church of missionary disciples—Pope Francis’s “Church permanently in mission”—will only be answered if we see today’s challenging, but evangelically exciting, situation clearly; and such clarity of vision requires something other than lenses ground in the 1970s. While it is important to have a dialectic about policy; Matt. 22:21 – Why don’t you Europeans worry about Europe and let Americans worry about America? We sure could use another strong leader like JP2 as Bishop of Rome. Which one is in favor in Rome today (or for the last 50 years)? “President Trump’s evangelical advisory board is asking Pope Francis for meetings with him and other high-level Vatican officials to discuss ‘efforts to divide evangelicals and Catholics.’ The request, which was first reported in Time, comes a few weeks after two of Francis’s closest allies published an extremely critical article about the shared political activism of conservative evangelicals and Catholics, saying it has ‘an ideology of conquest'” (Michelle Boorstein The Wash Post Aug 7). A relevant article since the issue addressed is not going away. I suppose there are “spasms of influence-envy”, a Manichean division of good guys [apparently Spadaro Figueroa Progressives] and bad guys [Faithful Catholics and more Catholic than Spadaro Figueroa Evangelicals]. The Evangelicals challenge the Pontiff on his Biblical interpretation regarding “walls” referring to border security. In fact it’s more than influence envy. The Catholic Evangelical alliance challenges Pontifical policy on immigration. Particularly the flooding of Europe with Muslims. And more. Rather than Christianity being conquered by Islam the Pontiff perceives the opposite. It’s not so much lenses ground in the Seventies. It’s Jaundiced vision. As a convert from the Southern Baptists to the Catholic Church, I’m afraid the issue is much deeper than immigration, however important that might be. It’s about the fundamental question of our times: Are their ANY moral norms that “the strong” — be they political leaders, religious leaders, or academic researchers — are unable to change, let alone make the changes binding on “the weak”? In the final analysis, does might really make right? The traditional answer is of course that might certainly does NOT make right, but today all of the secular world and most religious bodies seem convinced that it DOES. 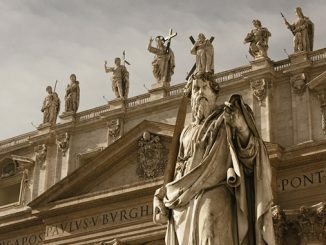 This question is basically the same as the second of the five dubia submitted to the Pope by four cardinals — dubia that the Pope, his reputation for humility notwithstanding, has not deigned to answer. Make no mistake about how important this question is. It is basically the question of whether or not there actually is a Logos — which even the pagan Greeks knew, though they had no way of knowing that the Logos would become flesh and dwell among us. This question is more important than the question of the existence of the United States or of the existence of Europe, to say nothing about the question of immigration into those places. Howard it appears your comment is a response to my post. This reply to a commentator to another article “Pope Francis: Jesus went to the Cross for sinners, not the perfect” should convince you I’m in agreement. “Your impression is that of many, Laity as well a eminent clergy. Does the Pontiff promote a doctrine that places primacy of conscience in lieu of Apostolic Tradition when the unavoidable difficulties of the human condition call for mercy not condemnation? What he is saying based on many previous statements including the premises contained in Amoris Laetitia is that such conditions leave countless many without hope. Unless the Church takes the first step of offering absolution and the sacraments. In effect that Christ’s Passion and Crucifixion alone save the sinner. It removes the obligation to turn away from sin. A [presumed] merciful act. I quote the Catholic Catechism on what I believe is congruent with the “Mystery of Iniquity”. “The Church’s ultimate trial. 675 Before Christ’s second coming the Church must pass through a final trial that will shake the faith of many believers. The persecution that accompanies her pilgrimage on earth will unveil the ‘mystery of iniquity’ in the form of a religious deception offering men an apparent solution to their problems at the price of apostasy from the truth. The supreme religious deception is that of the Antichrist”. Let me be clear: I do not think the Pope is the Antichrist. It is impossible that any Pope could be the Antichrist, given the protection that the Holy Spirit gives the Church. However, we know from history that although some Popes have been great Saints, even Doctors of the Church, others have been vain, worldly, even petty, to say nothing of those who may have been personally holy, but have been inept in management or clumsy in articulating the Faith. Pope Francis has received a great deal of praise from the world, which is at least an addicting temptation. In my view, he has completely dropped the ball on several occasions, and I can see real damage that has been done — yes, he may be popular among many non-Catholics, but are they drawn by him to join the Church? And what of the many non-Catholics who were being drawn to the Church, but who have been discouraged by the apparently intentional ambiguity in his statements and actions? But whenever the Pope leaves me discouraged, he next does something like demand the Belgian Brothers of Charity break all ties with euthanasia. It’s always tempting to treat the crisis du jour as a manifestation of the Antichrist, but it is really not hard to find crises as bad or worse in history. The deception of the Antichrist will be much more powerful, much more effective, and much less criticized. I’m not alleging Pope Francis is the Antichrist Howard. What he is doing fits the pattern of the “iniquity” referred to in the Catechism. The Pontiff’s actions in respect to what I criticized in my initial response leave me convinced those actions are in the spirit of Antichrist. Primarily because of his virtual denial of the Logos. I am very proud and very impressed by Mr. Donahue of the Catholic League for sticking up for the American Catholic’s after we were attacked by Spadara & Figueroa. I’m glad to hear Donahue spoke up. He is certainly paid very well enough to do so. The Catholic League would speak with greater authority if it did not seem to consist of Bill Donohue and no one but Bill Donohue. I know there are other people there, but they are kept silent in a way that reeks vaguely of a cult. Sad,sad article. Unite and don’t divide. The Gospel is clear on that, directly from the lips of Our Lord Jesus,and you are not helping. Academia and knowledge is different than Wisdom which comes from the Holy Spirit, and forgive me, but this is not what I sense from your article, as mean and divisive as the ones you attack. St. Paul in the First and Second Letters to Timothy, which I’m sure you know by heart, are very clear on this. I have your book Witness to Hope, about my Pope (I loved him then and love now as Saint, John Paul 2). Words of Wisdom everywhere, The Engaged Ascetic, what an example. I find myself waiting from you Words of Wisdom not what I just read (oh dear……? Spadaro/Figueroa write an article attacking the ECT. Weigel writes a clear essay, laying out the facts, defending the group. But he’s being divisive. What kind of logic do you use? Portside (il) logic. 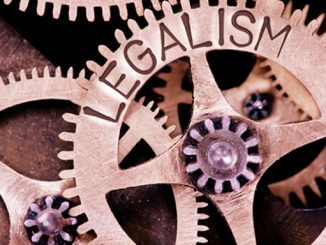 Leftists cannot articulate or defend their assertions either secular or ecclesiastical using reason, history, rightly interpreted Scripture or tradition. That just leaves name calling and straw man arguments. I’ve ceased “dialogue” with them because I don’t traffic in emotional tirades and histrionics.